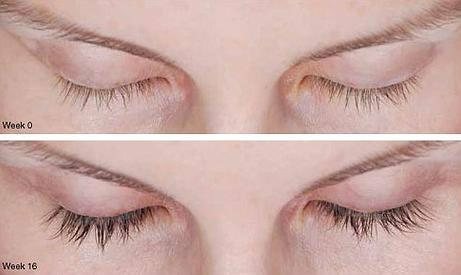 Latisse (known as bimatoprost ophthalmic solution 0.03%) was first discovered to make eyelashes longer and darker when it was being studied to treat the eye disease glaucoma. In those studies it was placed directly into the eye itself. Longer, darker lashes were an accidental result. Bimatoprost was found to prolong the anagen phase of the hair– that’s the growth phase when the hair becomes longer and darker. When applied to the eyelids just at the lash line, it will make those lashes longer and darker. It should be applied once a day to the upper lash line in the evening before bed. The full effect takes up to 16 weeks. Your lashes will look completely natural, because they are yours. If you find that the length is perfect after 8-12 weeks, you can cut back to using Latisse 3 days/week to for maintenance. The most popular misconception about Latisse floating about the interwebs is that it might turn your blue eyes brown. In the original studies where the drug was placed directly in the eye, some dark pigmentation to light colored eyes was reported. In the studies done with Latisse placed on the upper lids there were no reports of any change in eye color. Latisse can cause eye irritation in some people. It can also cause hyperemia (increased blood flow) at the lash line, and over time can darken the skin at the lash line. Most people tolerate Latisse really well. If you would like to find out more, schedule a 15 minute latisse consultation.